Dishwashing was definitely a chore! It ranked right up there with "take out the trash", "shovel the snow", and "mow the grass". At least it wasn't the dreaded, "clean your room!" There were certain incentives for washing the dishes. Once they were done, you could return to more rewarding tasks such as reading, playing board games, listening to the radio, putting together a puzzle, or working on hobbies such as stamp collecting. There was a plan. The chore was divided into two sections that were accepted on a rotating basis. (With the three of us, that meant a night off every so often.) One of us would wash the dishes. Items were arranged in the ascending order of greasiness. The drinking glasses came first, to be followed by the other glass or china ware. Then came the silverware which was followed by the pots and pans. 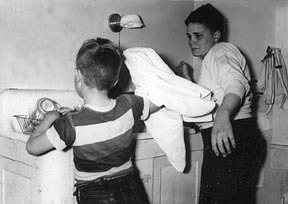 As the dishes were washed, the 'washer' would also be responsible for rinsing. Then the cleaned item was placed in the drainer basket for the 'dryer'. This is where the fun came into play. Whoever was assigned 'dryer' would inspect the washed item and had the option of declaring it to be still dirty and promptly return it to the dishwater, (sometimes before any other inspection could be initiated.) Oh, what great joy for the 'dryer', if he could get away with it! Now you can understand what is happening in the picture. Someone has just returned a clean item and is about to be splashed for his error. The 'dryer' would take the dried dishes to the cupboard, and neatly stow them to await the next meal.